The US Commodity Futures Trading Commission’s whistleblower program marked a banner year in FY 2018, reversing several years of flagging performance and setting several records for the program. 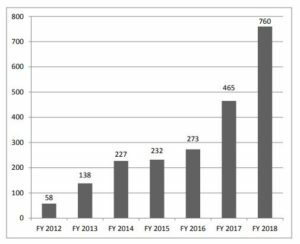 In its annual report to Congress about the CFTC whistleblower program that was released last week, the CFTC reports that in FY 2018 it more than doubled its previous total number of whistleblower awards, from four awards before 2018 to a total now of nine. Another highlight in FY 2018 for the CFTC whistleblower program was the payment of the largest whistleblower award since the CFTC program was created in 2010 – $30 million. That is three times the size of the previous largest payment, which was made in 2016. The highest number of whistleblower reports filed with the CFTC in one year. The 760 whistleblower reports that were filed constitute a 63 percent increase from the number received in FY 2017, and more than triple the number received in FY 2015. The first CFTC award to a foreign whistleblower, who received $70,000. The CFTC’s whistleblower program offers rewards to whistleblowers whose tips result in $1 million or more in monetary sanctions. Whistleblowers receive between 10 percent and 30 percent of the amount collected. Rewards are paid out of the Customer Protection Fund established by Congress, not from the sanctions that are collected in the case. Number of whistleblower reports received by the CFTC whistleblower office by fiscal year. As required by the Dodd-Frank Act, the CFTC keeps the identity of whistleblowers confidential. Learn more about the CFTC whistleblower program and rewards in our overview of the CFCTC’s whistleblower program.